View of the venue and platform of an April 11, 2018 central report meeting commemorating Kim Jong Un’s assumption of leading party and state positions (Photo: Rodong Sinmun). 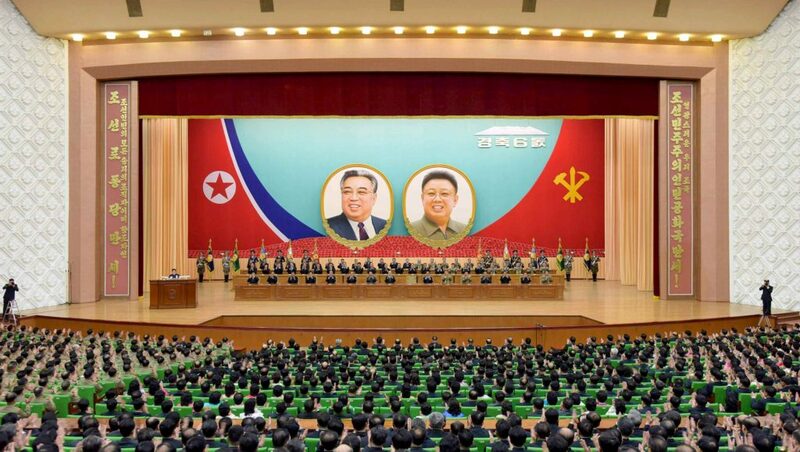 A central report meeting marking the sixth anniversary of Kim Jong Un’s [Kim Cho’ng-u’n] assumption of the top positions in the Workers’ Party of Korea [WPK] and DPRK Government was held on April 11 (Wednesday) at the People’s Palace of Culture in Pyongyang. DPRK Premier Pak Pong Ju bows after his arrival at the People’s Palace of Culture on April 11, 2018 for a central report meeting marking KJU’s elevation to top regime positions (Photo: KCTV). 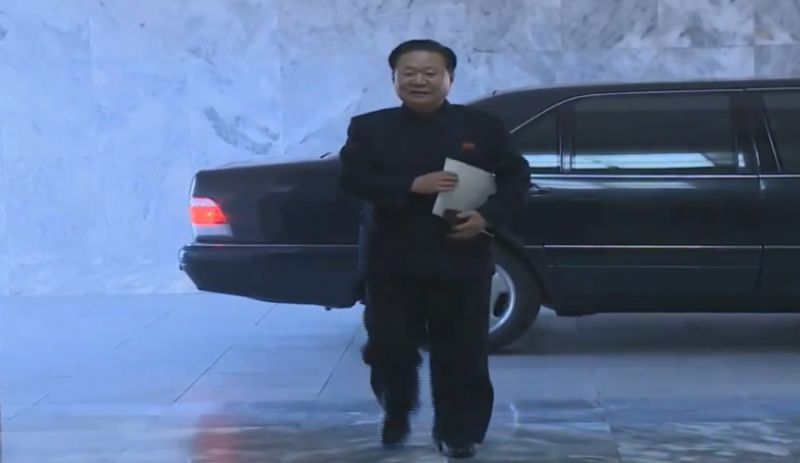 WPK Vice Chairman, State Affairs Commission Vice Chairman and WPK Organization Guidance Department Director Choe Ryong Hae arrives for the central report meeting on April 11, 2018 (Photo: KCTV). 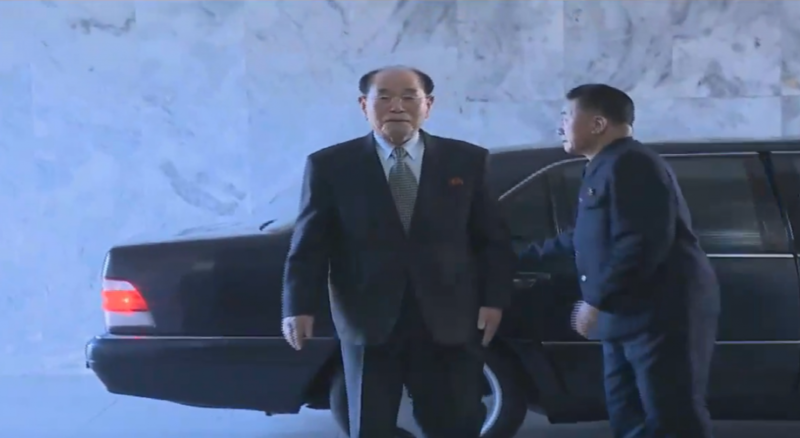 SPA Presidium President and DPRK nominal head of state Kim Yong Nam arrives for the central report meeting on April 11, 2018 (Photo: KCTV). Among those who sat on the platform were: Supreme People’s Assembly [SPA] Presidium President Kim Yong Nam (Kim Yo’ng-nam), WPK Vice Chairman and State Affairs Commission [SAC] Vice Chairman Choe Ryong Hae (Ch’oe Ryong-hae), DPRK Premier and SAC Vice Chairman Pak Pong Ju (Pak Pong-chu), Korean People’s Army [KPA] General Political Department Director VMar Kim Jong Gak (Kim Cho’ng-kak), Minister of the People’s Armed Forces Gen. Pak Yong Sik (Pak Yo’ng-sik), WPK Vice Chairman Pak Kwang Ho (Pak Kwang Ho), SPA Presidium Vice President Yang Hyong Sop (Yang Hyo’ng-sop), WPK Vice Chairman Ri Su Yong (Ri Su-yo’ng), WPK Vice Chairman O Su Yong [O Su-yo’ng], WPK Vice Chairman Kim Phyong Hae (Kim P’yo’ng-hae), WPK Vice Chairman Thae Jong Su (T’ae Cho’ng-su), WPK Vice Chairman An Jong Su (An Cho’ng-su), WPK Vice Chairman Kim Yong Chol (Kim Yo’ng-ch’o’l), Second Economy Commission [Second Economic Committee] Chairman No Kwang Chol (No Kwang-ch’o’l), Korea Social Democratic Party Central Committee Chairman Kim Yong Dae (Kim Yo’ng-tae), WPK Vice Chairman Pak Thae Song (Pak T’ae-so’ng), DPRK Vice Premier and State Planning Commission Chairman Ro Tu Chol (Ro Tu-ch’o’l), Minister of People’s Security Gen. Choe Pu Il (Choe Pu-il), Minister of State Security Jong Kyong Thaek (Cho’ng Kyo’ng-t’aek), WPK Vice Chairman Choe Hwi (Ch’oe Hwi), Pyongyang WPK City Committee Chairman Kim Su Gil (Kim Su-kil), WPK Inspection [Control] Commission Chairman Jo Yon Jun (Cho Yo’n-chun), North P’yo’ngan WPK Provincial Committee Chairman Kim Nung O (Kim Nu’ng-o), WPK Vice Chairman Pak Thae Dok (Pak T’ae-dok), WPK Organization Guidance Department Senior Deputy Director Ri Man Gon (Ri Man-ko’n), WPK Munitions Industry Department Senior Deputy Director and KPA Operations Command Group head Ri Pyong Chol (Ri Pyo’ng-ch’o’l), 1st Vice Minister of the People’s Armed Forces and KPA General Logistics Department Director Gen. So Hong Chan (So’ Hong-ch’an), Youth League Central Committee Chairman Pak Chol Min (Pak Ch’o’l-min), Women’s Union Central Committee Chairwoman Jang Chun Sil (Chang Chun-sil), DPRK Vice Premier and Minister of Agriculture Ko In Ho (Ko In-ho), DPRK Vice Premier Kim Tok Hun (Kim Tok-hun), DPRK Vice Premier Jon Kwang Ho (Cho’n Kwang-ho), Vice Minister of the People’s Armed Forces Col. Gen. Kim Hyong Ryong (Kim Hyong-ryong), along with DPRK Cabinet Vice Premiers, Cabinet Ministers, Department Directors of the State Affairs Commission, senior KPA and WPK officials and some DPRK workers who have received state awards. Hwang Pyong So (front row, L) and Kim Kyong Ok stand during the playing of the DPRK national anthem at the People’s Palace of Culture on April 11, 2018 (Photo: KCTV). Senior party officials attend the central report meeting marking KJU’s elevation to top party and state posts (L-R): Kim Ki Nam, Kwak Pom Gi, Kim Jong Im and Jon Il Chun (Photo: KCTV). Among those sitting in the gallery were: Personal Secretary deputy chief and WPK Organization Guidance Department Deputy Director Jo Yong Won (Cho Yo’ng-wo’n), WPK Finance and Accounting Department Director Kim Yong Su (Kim Yo’ng-su), WPK Party History Institute Director Kim Jong Im (Kim Cho’ng-im), Worker-Peasant Red Guard Commander and WPK Military Affairs Department Director Ri Yong Rae (Ri Yo’ng-rae), WPK Organization Guidance Department Senior Deputy Director Kim Kyong Ok (Kim Kyo’ng-ok), WPK Organization Guidance Department Senior Deputy Director and immediate past KPA General Political Department Director Hwang Pyong So (Hwang Pyo’ng-so’), WPK Munitions Industry Department Deputy Director Hong Sung Mu (Hong Su’ng-mu), WPK Munitions Industry Department Deputy Director Hong Yong Chil (Hong Yo’ng-ch’il), WPK Workers’ and Social Organizations Department Director Ri Il Hwan (Ri Il-hwan), Former WPK Propaganda and Agitation Department Senior Deputy Director Ri Jae Il (Ri Ch’ae-il), WPK Finance and Accounting Department Deputy Director Jon Il Chun (Cho’n Il-ch’un), WPK Agriculture Department Director Ri Chol Man (Ri Ch’o’l-man), Minister of Culture Pak Chun Nam (Pak Ch’un-nam), SPA Chairman (speaker) and former WPK Vice Chairman Choe Thae Bok (Ch’oe T’ae-pok), former WPK Vice Chairman and WPK Planning and Finance Director Kwak Pom Gi (Kwak Pom-ki), former WPK Vice Chairman Kim Ki Nam (Kim Ki-nam), former WPK Munitions Industry boss Pak To Chun (Pak To’-ch’un), WPK Department Director Ju Yong Sik (Chu Yo’ng-sik), South P’yo’ngan WPK Provincial Committee Chairman Kim Tu Il (Kim Tu-il), Ryanggang WPK Provincial Committee Chairman Ri Sang Won (Ri Sang-wo’n), Kangwo’n WPK Provincial Committee Chairman Pak Jong Nam (Pak Cho’ng-nam), South Hwanghae WPK Provincial Committee Chairman Choe Jong Ryong (Ch’oe Cho’ng-ryong), Namp’o WPK City Committee Chairman Kang Yang Mo (Kang Yang-mo), cadets of the Mangyo’ngdae and Kang Pan Sok Revolutionary Schools, other senior WPK and KPA officials, DPRK Cabinet Ministers and Commission Chairs, chief functionaries of various state institutions, media organizations, managers and exemplary employees of production units in Pyongyang and other DPRK citizens. 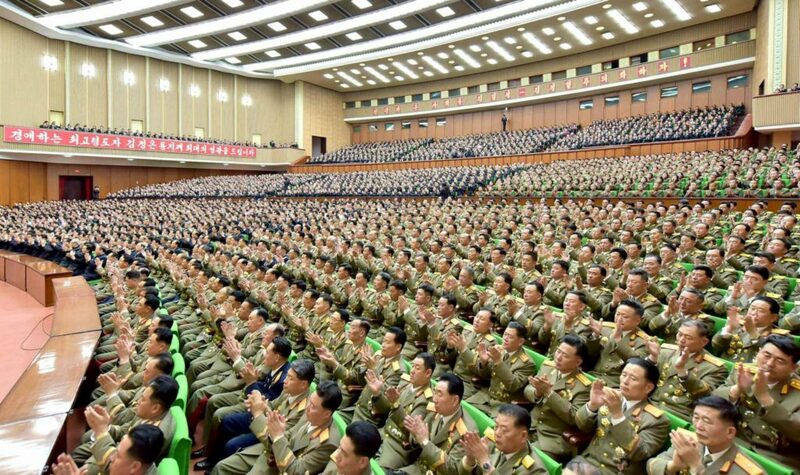 View of the venue and participants at the April 11, 2018 meeting commemorating KJU’s assumption of top party and state jobs (Photo: Rodong Sinmun/KCNA). WPK Vice Chairman and Director of the WPK Propaganda and Agitation Department Pak Kwang Ho presides over the meeting (Photo: KCTV). 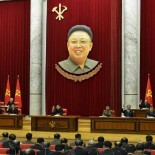 WPK Vice Chairman and WPK Propaganda and Agitation Department Director Pak Kwang Ho presided over the meeting. WPK Vice Chairman, SAC Vice Chairman and WPK Organization Guidance Department Director Choe Ryong Hae delivers the report (Photo: Rodong Sinmun). 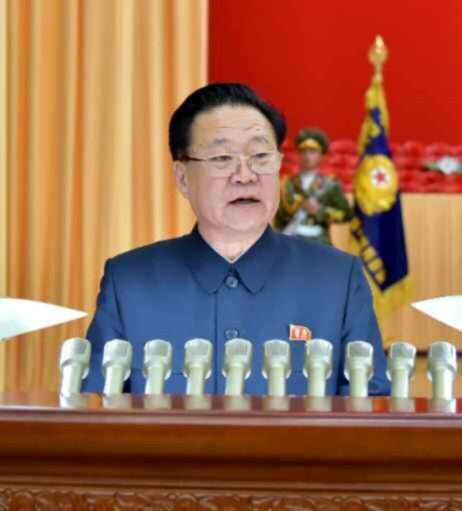 Kim Jong Un’s assumption of the top posts of the Korean revolution was the greatest honor of the country and the people, and a great auspicious event in national history which is of immense historic significance in carrying forward and accomplishing the Chuch’e cause. With his leadership over the party and the state, the WPK has become to enjoy greater prestige, and the DPRK has made to strikingly manifest its strategic position and tremendous might and the Korean revolution could advance with confidence toward the final victory. The past six years were days when the overall state might of socialist Korea was put on the highest ground in the history of the nation under the outstanding leadership of Kim Jong Un. The history of human politics does not know such a matchless hero and peerless patriot as Kim Jong Un who has put the dignity and position of a country and a nation on the highest level in such a short period and created the new history of bolstering the socialist national power. The country and people will never forget the great solicitude and patriotic exploits of the respected Supreme Leader who terminated the threat of aggression by the imperialists and provided a sure guarantee for the happiness of all posterity to come and the bright future, and will convey them generation after generation. Kim Jong Un represents the powerful might of Chuch’e Korea as he has displayed the independent dignity and might of the country all over the world, and is the great sun leading the 21st century, calling on all to dynamically fight toward the final victory of the cause of the Chuch’e revolution, rallied close around the respected Supreme Leader. 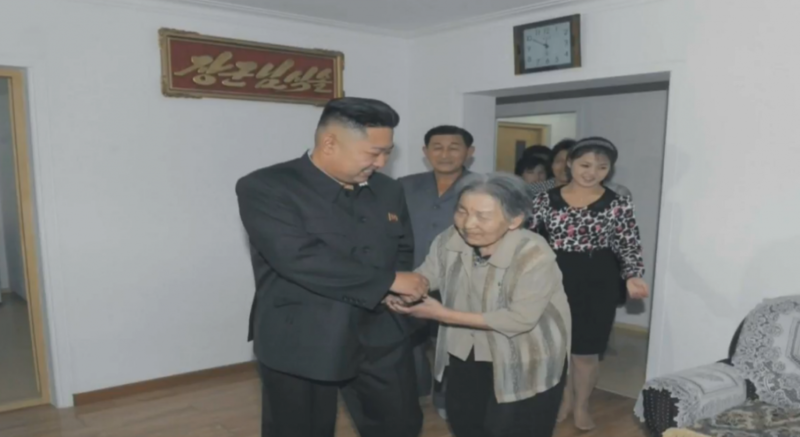 Kim Jong Un and Ri Sol Ju visit residents of an apartment building in 2012, in a photo shown as part of a slideshow during the recorded TV relay of the April 11, 2018 report meeting (Photo: KCTV/KCNA). 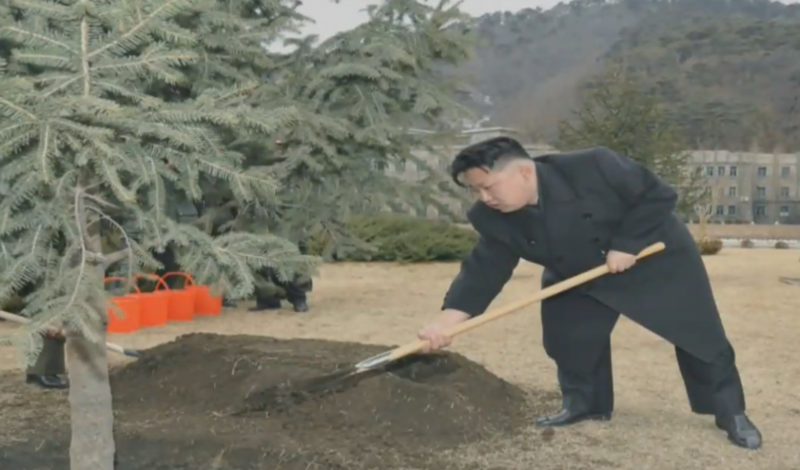 Kim Jong Un plants a tree during a visit to the KPA Strategic Force headquarters element in Kangdong County, Pyongyang, which was featured in a slideshow on the recorded TV relay of the April 11, 2018 central report meeting (Photo: KCTV/KCNA). This article was written on 13 Apr 2018, and is filled under Agriculture Department, An Jong Su (WPK LID), Cadre Affairs, Central Broadcasting Committee, Central Committee, Central Military Committee, Central Party Affairs/Cadres 5th Section, Choe Hwi (PAD], Choe Jong Ryong [SHW WPK], Choe Ryong Hae, Choe Tae Bok, Choe Tong Myong [SED], Col. Gen. Kim Hyong Ryong, Col. Gen. No Kwang Chol (KPAGS), Col. Gen. So Hong Chan, Democratic Front for the Reunification of the Fatherland, DPRK Cabinet, DPRK Premier, Economic Complexes, Education Commission, Executive Policy Bureau, Finance and Accounting, Five Year Economic Plan and Development Strategy (2016), Gen. Choe Pu Il, Gen. Kim Yong Chol, Gen. Pak Yong Sik (MPAF), Gen. Ri Pyong Chol, General Affairs, General Federation of Trade Unions of Korea, Guard Command, Hong Sung Mu, Hong Yong Chil (KWP MBID), Hwang Pyong So, Hwang Pyong So (GPD; KPA VMAR), ideological slogans, Ideological Works, Im Chol Ung (DPRK Vice Premier WPK PB), internal security, Jagang KWP Provincial Committee, Jang Chol (State Academy of Science President), Jo Yon Jun (OGD), Jo Yong Won, Jon Il Chun, Jon Kwang Ho, Jong Kyong Thaek (State Security), Ju Yong Gil (GFTUK), Kang Yang Mo, Kangwo'n Provincial KWP Committee, Kim Chang Yop (UAWK), Kim Family, Kim Il Sung Youth League, Kim Jae Ryong (Jagang WPK Provincial Committee Chief Secretary), Kim Jong Un Visits, Kim Jong-il, Kim Jong-un, Kim Ki Nam, Kim Ki-nam, Kim Kyong Ok (OGD), Kim Nung O (NPyongan WPK), Kim Phyong Hae (Cadres/NPYPPC), Kim Tu Il, Kim Yong Dae, Kim Yong Nam, Kim Yong Su (WPK CC DD), kisyl, KJI Personal Secretariat, KJI-Ko Yong Hui Family, Ko In Ho, Korean Democratic Women's Union, Korean People's Internal Security Forces, Korean Social Democratic Party, Korean Workers' Party (KWP), KPA General Logistics Department, KPA General Political Bureau, KPA General Political Department, KPA General Propaganda Department, KPA Organization Department, KPA Party Life, kpif, Kwak Pom Gi, Lt. Gen. Kim Su Gil, Machine Building Industry Department, Ministry of Culture, Ministry of Finance, ministry of people's security, Ministry of State Security, Ministry of the People's Armed Forces (MPAF), Namp'o WPK Committee, North Hwanghae Provincial KWP Committee, North Korean press, North Pyongan KWP Provincial Committee, O Su Yong, Organization and Guidance Department, Pak Chol Min [KISYL], Pak Chun Nam (MOC), Pak Jong Nam (Kangwon WPK PC), Pak Kwang Ho (PAD), Pak Pong Ju, Pak Tae Dok (N. Hwanghae WPK), Pak Thae Song (KWP CC Dept), Party elders, Party History Institute, party life, Party Life Guidance, Political Bureau, primary party committees, Propaganda and Agitation Department, Provincial Party Committees, Provincial Party System, Provinicial People's Committee, Public Events, Pyongyang Defense Command, Pyongyang WPK Committee, Ri Chol, Ri Chol Man (DPRK Vice Premier/Minister of AG), Ri Il Hwan, Ri Jae Il (PAD), Ri Ju O (DPRK Vice Premier), Ri Man Gon (N. P'yo'ngan WPK PC), Ri Pyong Chol, Ri Ryong Nam, Ri Sang Won (Yanggang WPK PC), Ri Su Yong, Ro Tu Chol, Ryang Jong Hun [NHWA WPK PC], Ryanggang KWP Provincial Committee, Second Economic Committee, Second Economy Commission, Secretariat, social control, South Hwanghae KWP Provincial Committee, South P'yo'ngan KWP Provincial Committee, State Academy of Sciences, State Affairs Commission, State Planning Commission (SPC), State Security Department, Supreme People's Assembly, Tae Jong Su, Thae Hyong Chol (KISU President-MOHE), uawk, United Front Department, VMar Kim Jong Gak, Worker Peasant Red Guard, Workers' and Social Organizations, WPK Economic Affairs Dept, Yang Hyong Sop, Yanggang Province, Yangkang Province.